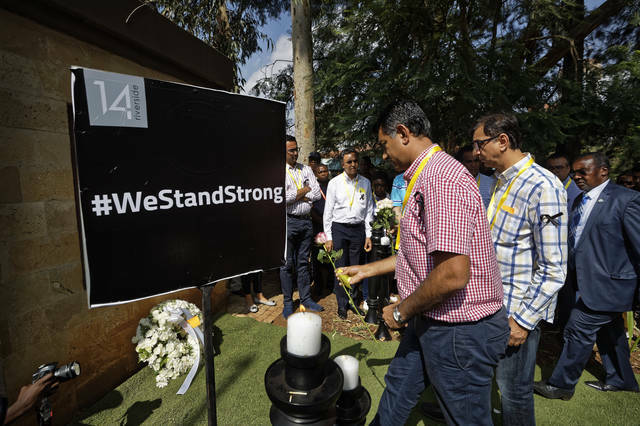 New details of the Jan. 15 assault on the dusitD2 hotel and office complex in Kenya’s capital emerged on Tuesday during a church memorial for six employees of digital payments company Cellulant who were killed. The tribute touched on the terrifying last moments of the young men, as well as the anguish of colleagues in safety, who were receiving phone messages from trapped friends. “Our teams would tell us, ‘Help us, help us. This is where we are. The gunshots are coming closer and closer,’” said Ken Njoroge, CEO and co-founder of Cellulant, which operates in several African countries. 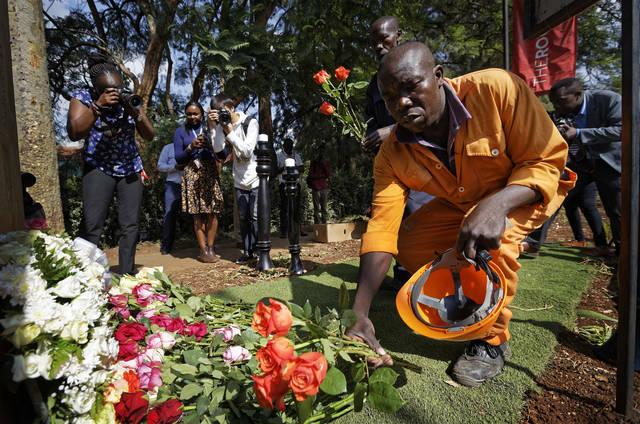 Workers in the Cellulant offices on the fifth and sixth floors of the Cavendish building, beside the hotel, thought a blast at around 3 p.m. on the day of the attack was a “gas explosion” and weren’t particularly alarmed, Njoroge said. A few minutes later, they heard another explosion followed by gunfire. They headed for the exits. Some 83 out of 100 workers in the Cellulant offices at the time escaped, but the rest didn’t make it out and split into two groups, he said. Six hid in a small room under the stairs on the first floor, and the other 11 returned to the fifth floor, where they also split: The men into the men’s bathroom, and the women into the women’s bathroom. 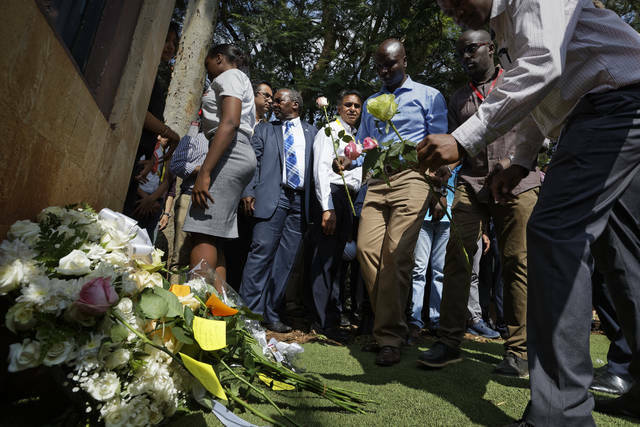 Continuing with his account, Njoroge said one or two gunmen flung open the door to the men’s bathroom on the fifth floor, grabbed 36-year-old Ashford Kuria Maina, pulled him out and killed him. “‘They’ve taken Ashford and we’ve heard some gunshots,’” a colleague texted to friends who were safe, providing a nearly instantaneous report on the horror. Attackers pushed the door to the women’s bathroom but were unable to enter because the women pushed back, according to the account. The gunmen left. For the six Cellulant employees hiding on the first floor, it was “as if this guy was actually walking on their heads” as they listened to a gunman descend the stairs, according to Njoroge. The gunman “opened the door and had a conversation with them, introduced himself as al-Shabab” and killed five people, the company CEO said. The sixth employee survived because her male colleagues protected her by tucking her at the back of the room. She smeared blood on herself to pretend that she was also a casualty, Njoroge said. CAIRO (AP) — Sudan’s embattled president flew Tuesday to Qatar, the tiny but wealthy Gulf state that has offered him help as he faces protests initially sparked by the country’s economic woes but which soon shifted to calling on him to step down. Sudan’s official news agency reported his departure from the capital Khartoum, saying he and Sheikh Tamim will discuss bilateral relations and efforts to cement peace in Darfur, the western Sudanese region where security forces brutally crushed a rebellion. Al-Bashir was indicted in 2010 by the International Criminal Court for genocide in Darfur, where an insurgency erupted in 2003. To avoid arrest and repatriation to The Hague, the court’s seat, he has restricted his travel to African and Arab nations. The dispatches by the two agencies gave no other details on the Sudanese leader’s visit, but in a Dec. 22 telephone call to al-Bashir, Qatar’s ruler stated his country’s readiness to “provide all that is needed” to help Sudan get through its crisis, according to a report by the official Sudanese news agency. There has been no word since on whether the emir made good on his pledge, but the Sudanese leader’s visit is widely interpreted as a bid to secure urgent financial aid to Sudan, which lost three quarters of its oil wealth when the south of the country seceded in 2011, plunging the country into its worst economic crisis in decades. A devaluation of the currency in October pushed up prices, but lifting state subsidies on bread last month proved to be the final stroke, sparking the latest bout of unrest. A cash crunch also led to long lines at ATMs and limits on cash withdrawals. Similarly, a fuel shortage meant hours-long wait at gas stations. Al-Bashir, in an apparent bid to placate growing discontent, has promised to raise salaries, restructure the banking sector and continue to subsidize basic food items, but he did not say how he intended to fund these measures. Significantly, al-Bashir’s key Gulf allies Saudi Arabia and the United Arab Emirates have made no official pronouncements explicitly supporting him. Egypt, Sudan’s powerful neighbor to the north, has publicly announced its support for stability and security in Sudan but, again, made no mention of al-Bashir. The three countries — Egypt, Saudi Arabia and the Emirates — are at sharp odds with Qatar, accusing the energy-rich nation of supporting radical Islamic groups in the region and forging close ties with Iran, archrival of the Saudis and the Emiratis. An Islamist, al-Bashir has often in the past appeared to be playing one ally against another for his own gain. Beside Qatar, for example, he has forged close ties with Turkey, another rival of his Arab allies. He has sought to win the goodwill of the Saudis by dispatching Sudanese troops to Yemen to fight alongside a Saudi-led coalition against Shiite rebels aligned with Iran. More recently, he has blamed the unrest, now in its fifth week, on saboteurs and what he repeatedly calls foreign schemes against Sudan. Already among the longest serving leaders in the region, he has said any change of leadership could only come through the ballot box, a reference to next year’s presidential elections in which he is expected to run for another term in office. Al-Bashir’s security chief, Salah Qoush, has given rare insight into the government’s views on the unrest in a leaked audiotape purporting to contain remarks he made at a closed meeting Sunday. The authenticity of the tape could not be independently verified, but Sudanese activists said the voice matched Qoush’s. He blamed the unrest on secularists and communists and vowed that Islamic rule in Sudan would “never ever” be brought down by demonstrations. “We must revise (our policies) and improve our performance, but we must also defend our (Islamic) experiment,” said Qoush, himself an Islamist. “The government will not fall, not even after six months of protests,” he added. JAKARTA, Indonesia (AP) — Indonesia’s president said Tuesday that an elderly Islamic cleric who inspired the Bali bombers and other extremists won’t be released from prison unless he renounces radicalism, backing down from plans to free him without conditions. Bashir, 80, insists he is only answerable to God and that Indonesia should be governed by Islamic rather than civil law. “Abu Bakar Bashir is already old and his health is also deteriorating. You can imagine if we as children see our parents sick,” Widodo told reporters. “However, we also have a legal system here. There are legal mechanisms that we must go through. This is parole, not pure release, but conditional release, so the conditions must be fulfilled first,” he said. Widodo on Friday said he had agreed to free Bashir on humanitarian grounds. The announcement came during campaigning for a presidential election due in April in which opponents of Widodo have tried to discredit him as insufficiently Islamic. But on Monday, as domestic and international criticism mounted, the government announced a review of his release. The 2002 Bali bombings killed 202 people, including 88 Australians. Australian Prime Minister Scott Morrison urged Indonesia’s government to show respect to the Bali bombing victims, which included numerous Indonesians. “We don’t want this character able to go out there and incite the killing of Australians and Indonesians, preaching a doctrine of hate,” Morrison said. Disclosure statement: John Munro has been a chief researcher on ARC funded projects and has completed contracted projects for Australian educational authorities. Partners: Victoria State Government provides funding as a strategic partner of The Conversation AU. Australian Catholic University provides funding as a member of The Conversation AU. A year three class was learning about beetles. We turned over a rock and saw slater beetles (also known as wood lice, pill bugs or roley poleys) scurrying away. I asked: Has anyone thought of something I haven’t mentioned? Marcus, a student in the class, asked: How many toes does a slater have? I asked: Why do you ask that? Marcus replied: They are only this long and they’re going very fast. My mini aths coach said that if I wanted to go faster I had to press back with my big toes. They must have pretty big toes to go so quick. As well, teachers are usually not qualified to interpret IQ assessments. The parents in the Insight program mentioned both the difficulty in having their children identified as gifted and the high costs IQ tests incurred. In Australia, these assessments can cost up to Australian $475.